If you’re coming by car or truck, virtually all roads lead to the Javits Center. Plus, there’s plenty of off-site parking within walking distance of the iconic facility. And if you’re looking to burn some calories while blazing a trail to our front door, take advantage of Citi Bike, New York’s new bike sharing system. The NY Waterway is also a convenient and quick way to get to the Javits Center from across the Hudson River, and only one block from the Javits Center. Arriving from out of NY? Whether you are arriving by car, plane, or truck, we have directions for you. We've also included a handy parking map below that doubles as a metro map. For complete transportation information including how to get to Manhattan by public transportation from all three airports, including the JFK AirTrain, log onto the NY/NJ Port Authority at www.panynj.gov. $0.50 night surcharge after 8:00 p.m. and prior to 6:00 a.m. Different variables such as heavy traffic and tolls should be taken into account in gauging the final cost of your trip. A cab ride between Grand Central, Penn Station or Port Authority to the Javits Center can cost anywhere from $8-$15 depending on the traffic. Trucks higher than 12 ft. 6 in. will not clear tunnels. They must use a bridge. Also remember that no trucks are allowed on parkways. Please visit http://www.nyc.gov/html/dot/html/motorist/trucks.shtml for New York City Rules for Trucks & Commercial Vehicles. Visit the Port Authority website at http://www.panynj.gov/truckers-resources/ for Truck and Special Vehicle Resources, including width, height and length restrictions. For current Lincoln Tunnel restrictions click here. For current George Washington Bridge restrictions click here. Street Directions: Continue on Broadway to the intersection of Broadway, West 65th Street and Columbus Avenue. Bear right onto Columbus. This becomes 9th Avenue at 59th Street. Stay on 9th Avenue to 34th Street. Follow westbound signs to 11th Avenue. From Long Island–Route 495 (Long Island Expressway): To Queens Midtown Tunnel. Take southbound or downtown exit to 34th Street and turn right. Follow westbound signs to 11th Avenue. Manhattan Bridge: Follow westbound signs to 11th Avenue. Note: Some lane restrictions may be necessary. Electronic signage will direct truck and other traffic whenever detours are necessary. From the Verrazanno Narrows Bridge, take the Gowanus Expressway to the Brooklyn Battery Tunnel. Follow westbound signs to 11th Avenue. See directions from George Washington Bridge. Citi Bike is New York’s popular new bike sharing system, which features thousands of bikes at hundreds of stations around the city. The bikes can be rented from and returned to any station in the system, and are available 24/7, 365 days a year. You may choose to purchase a 24-Hour Access Pass for $9.95 or a 7-Day Access Pass for $25. Access Passes may only be purchased at Citi Bike stations, using the touchscreen kiosk. A Citi Bike station is conveniently located on 34th Street at 11th Avenue. 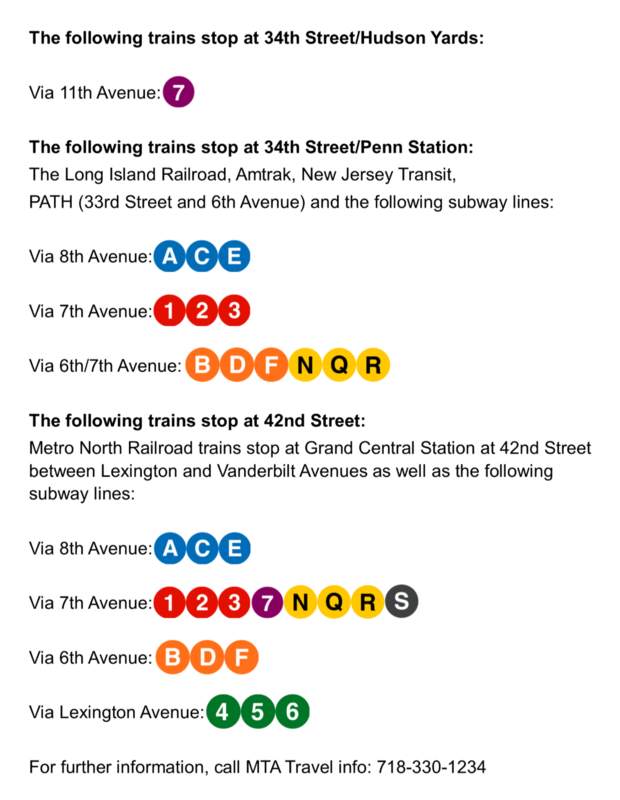 There are a variety of lots open nearby the Javits Center, ranging from 24-hour, 7-days a week, to more limited service. This map will help you navigate through all the options, so you can find the right spot for you.